I always go back and forth on what I should wear on an airplane. I want to look “presentable”, but I also want to be comfortable. Days of me walking down the terminal in Jimmy Choos are gone (those were good days)! Thankfully, the Athleisure trend is going strong and offering comfortable and super cute options. I have tried many workout brands at all different price points, and I have to admit, you don’t have to spend a lot to get a great legging! These Gap high-rise full length pants come in 3 print options are on sale and range from $40-$65! How can you beat that? When I’m on an airplane I always want to be cozy (I’m usually cold), so this sweatshirt from Shop Bop is perfect. And I love the stripe detail on the sleeve. Accessories: my FAVORITE new Golden Goose high tops (probably the most comfortable shoe I have ever own) and a MCM belt bag. To be honest, I wasn’t completely sold on the belt bag when they came out. I had to warm up to the idea, but this one is amazing. Super cute print, perfect size (wallet, passport, lip gloss! ), and my hands are free to carry everything else! Spring break is around the corner, and I am super excited for my trip to the Caribbean! I am ready for some sun on my face and relaxation. I’m bringing 5 books…hoping to get through 3…LOL. I am loving the TIERED SKIRT trend. It is super feminine and perfect for an island vacation. I fell in love withs this Cinq a Sept skirt, the moment I saw it! And the floral pattern is perfect for an island atmosphere and did I mention it’s on sale?? I decided to make the look a little bit more casual pairing it with a denim shirt from Madewell, white heels, and a Rebecca Minkoff clutch. The Caribbean tends to be a bit more laid back and this look checks off all the boxes! I am super excited to partner with Alba, an incredible boutique that recently opened in Morristown! I am so happy to have a new, and fun clothing store in my town. And let’s face it, shopping local is so great - the mall can be so overwhelming and crowded. Alba has three other locations: Summit, Ridgewood, and Hoboken. What I love about Alba is that everything is wearable. From jeans and tees to rompers and amazing accessories, Alba has it all and at great price points too! When I go shopping I look for pieces that are versatile and will work well with my existing wardrobe. And there is nothing better than taking your look from day to night by just changing your shoes! That’s how I felt about this amazing look from Alba. I’ve always been a fan of monochromatic looks - it makes getting dressed so easy! So, I went with my 2nd favorite color to wear, navy! (black being the first, LOL). These navy waxed jeans are amazing. They have great, stretchy fit and are very flattering. I paired them with a basic white tee and a fuzzy, fur bomber (super cozy). I broke up the navy by adding in a great white bag that can fit everything from your phone to your laptop! This look would work with high top sneakers or the heels I’m wearing! Definitely visit Alba in one of their four locations and on Instagram. I promise you will walk out a very happy and well-dressed customer! I had so much fun at Lauren B. that I have two more looks to share with you! This first look is perfect for work or dinner with friends! I love this Molly Bracken blazer. It is such a cute twist of a blazer and a bomber jacket. I paired it with a gorgeous diamond print blouse by Part Two, and black fitted pants with ruffle trim by Cambio. For accessories this shimmer red clutch by PIxie Mood provides a great pop of color! Other accessories include: matte silver and pearl necklace by Origin and earrings by Marlyn Schiff. Everyone needs a black jumpsuit and a leopard coat in their wardrobe. It’s a fact! This look is perfect for one of those upcoming holiday parties on your calendar! This Only Hearts light weight velvet stripe romper is so sophisticated and comfortable - perfect combo! The Manda Leopard coat is by Part Two, and is so great because it can be worn with anything from a black jumpsuit to jeans and a tee shirt! Super versatile. Accessories: Necklace by Origin, Earrings by Marlyn Schiff, and black feather faux leather clutch by Shiraleah. What’s better than having a fabulous neighbor? Well, having a fabulous neighbor who owns an awesome women’s boutique in your town! I am so excited to partner again with Lauren B., and bring you 3 gorgeous looks for Fall. 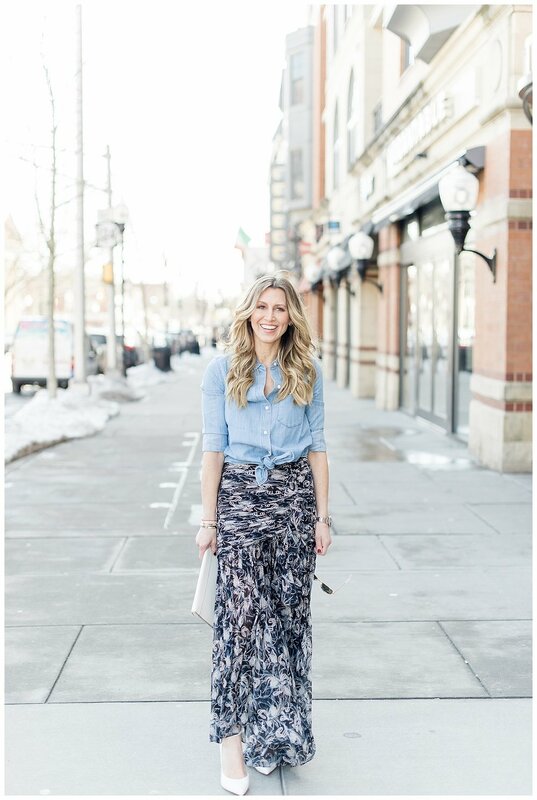 What is so amazing about Lauren’s store is that she can dress you for every occasion - whether it’s running to lunch with friends or attending a cocktail party Saturday night. And the beautiful accessories in her store finish every look perfectly! I had so much fun putting this first look together! It is perfect for a holiday cocktail party! The skirt and blazer are both by Molly Bracken. I decided to use the blazer as a top and tie it with a Streets Ahead belt. Accessories: Abalone clutch by Pinkhouse and silver cuff earrings by Marly Moretti. The second look screams Fall! 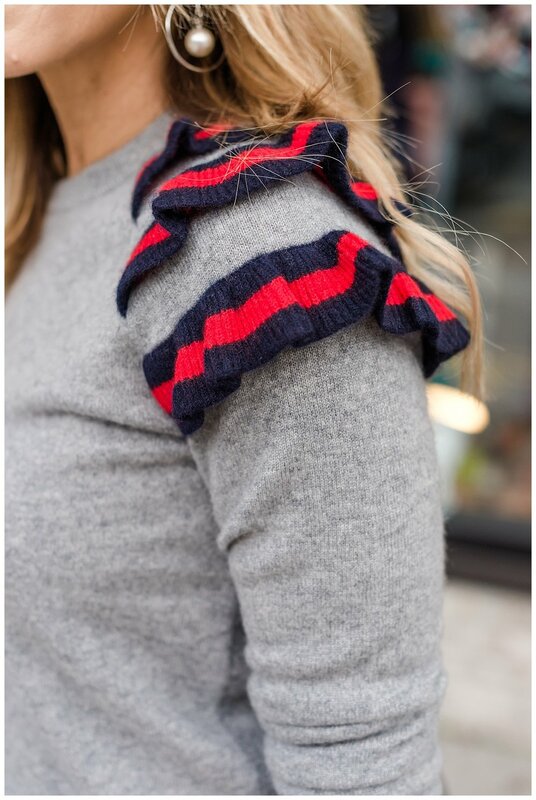 I live in cashmere in the Fall and Winter, and this sweater by Madeleine Thompson is a must-have. How fun is the shoulder detail? I paired the sweater with a great, stretchy Cambio pant and fun felt hat by Toucan Collection. Accessories: gorgeous metallic navy tote by Jijou Capri and pearl drop earrings by Zenzii. 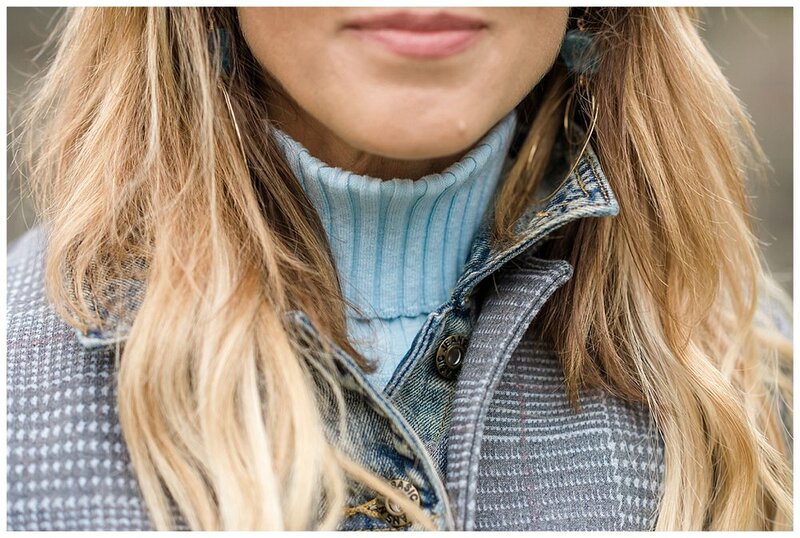 The final look mixes two of my favorite things: denim and plaid! How great is this jacket by Amici? I chose this COA gray skirt not only for the easy fit, but also for the fabric. It feels like you are wearing pajamas! I added a pop of color with a OSA fitted turtleneck and M. Liz drop earrings. 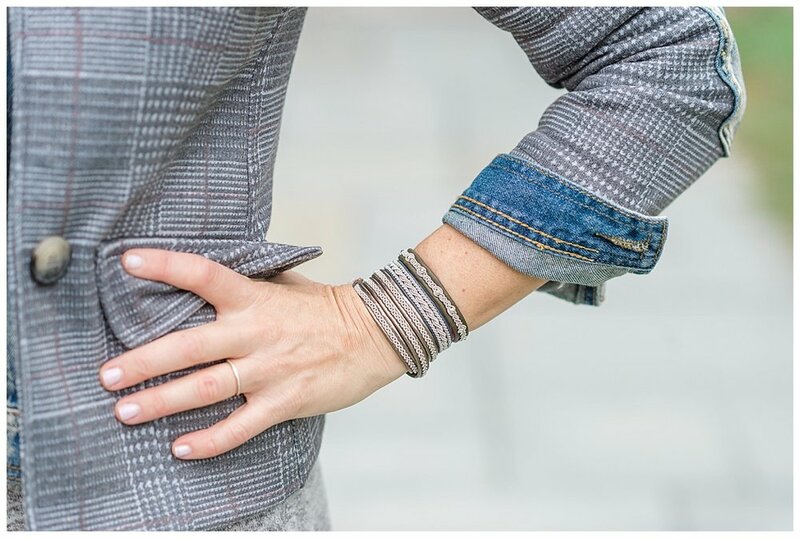 Final touches: a gorgeous Latico neutral tote and stacked leather bracelets by Hannah Wallmark.